I’m often quite traditional in my information gathering, usually finding out about books through printed reviews, or more often just wandering round book shops, but I discovered White Crane through their twitter account. I’m quite new to comics, having had an upbringing that didn’t really have space for comics beyond the type of kids books brought from corner news agents (Lian Huan Hua). However, they are an important part of popular culture, and when I saw this title, a Kung Fu inspired comic in English, the amalgamation of traditional and pop culture, Eastern subject for Western readers, it really struck a chord with me. Thank you to Zanna Vaughn-Davies, the writer of this work, who sent me a PDF of the first collected volume. 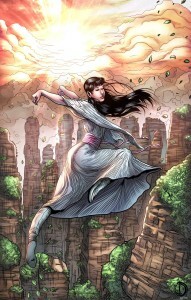 “White Crane: The Legacy of Fang Chi”, written by Zanna Vaughn-Davies, with art by Santiago Espina, tells the story of the eponymous young heroine, who trains in Tai Ji Quan in the Tai He Mountains under the rigorous and ascetic instructions of her warrior father, Fang Hung. Smart, spirited and impetuous, Chi is weary of Hung’s reproaches and can’t wait get into real fights, despite her father’s prohibition and the entreaties of Nanny Mu, both concerned for the safety of this motherless child. When the nearby temple is invaded by followers of the serpent cult, Hung is brutally murdered by their leader, the demonic Lung. Fuelled by grief and rage, Chi vows to avenge him. During her mourning, a white crane appears before her, leading her to a new master. Meanwhile, the serpent cult is harnessing the energy from the “Point of Maximum Yin” at the temple (handy maps appear on the first few pages of the graphic novel), to fuel their forbidden magic, upsetting the balance of the universe. The maps, in the style of classical ink wash paintings, are simply stunning, as are the issue covers and bonus artwork. The dagger like narrative font speaks of asian calligraphy, without being china-lite, and could not be more aptly chosen. Artist Espina varies the art style, reflecting the changes in tone between prologue and main story. 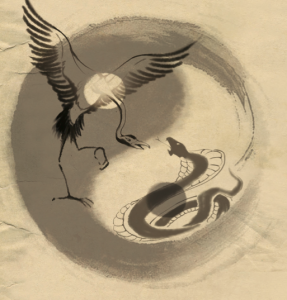 A pastel palette and soft lines of the former suit the lighted hearted banter between Wang, Guardian of the Watchtower, and Mu in the prologue. Later in the story, visibly more angular, thicker lines, increased shadows and heavy contrast, reflect the brutality of Lung and Chi’s tragic circumstances. Even the characters’ features, especially Chi’s, alter from relatively round to more chiseled. Espina’s artwork is very reminiscent of that bordertime in the early nineties, where comic art became a grown up thing; falling somewhere between late Miller era Daredevil, and Mike Dringenberg’s run on “The Sandman”, especially with Pan the Mad Man’s resemblance to Dream. The sequencial art, especially of the fight scenes, reveal a combination of western influences and samurai manga. With the use of Wuxia tropes and archetypes such as the strong female heroine, the crazy masters, and cave dwelling hermit Shi Fu, no wonder critics have said that the book “reads like a Shaw movie”. The look of the serpentine Lung, with his green hued skin, tapered villain’s moustache and goatee, takes more than a pinch from early versions of Marvel’s Mandarin, and even Fu Manchu. This work is far from simply rote representation of Chinese fantasy, and it’s a delight to find elements of Scifi rising to the surface in this heady mix. For example, the esoteric sources from which the serpent cult draw elemental energy for their dark magic, and the author’s hypothesis of the origin of the Dao, the art of change in the Cosmos. Badass oneliners and a certain foulmouthedness, give the piece an almost Tarentinoesque feel. The most beautiful page of this volume shows Chi connecting with the spirit of the crane, in a full bleed piece that is a perfect union between text and illustration, art form and meaning, inviting the eye to linger long enough for the concept to sink in. The main characters are all nicely fleshed out. We are reminded that aside of being heir to a Kung Fu clan and warrior-in-training, Chi is also a teenage girl, “and maybe I don’t want to improve, anyway! All we do is train! My friends are meeting boys…”. We see her development, but not at the cost of the story’s dynamism. I have a couple of minor quibbles with this comic. The deathly pallor of our heroes, despite the story’s setting of southern China, really does seem a little too much of a “white-washing”, and as an academic, the phoneticisation of Chinese terms seems to mix antique Wade Giles and modern Pinyin terms. It would be good to have some consistency. One can tell that the author knows his Wu Dang Fist from his Yong Chun Kicks. Vaughn-Davies points out in his closing note that he has spent 15 years studying it. We’re given just enough details for the background information to flavour the plot, but not so much it encumbers it. Simple, but important things, such as the difference between Tai Ji and Shaolin schools, are dealt with laconically in the dialogue, without seeming like too much of an exposition. Zanna Vaughan-Davies has been a magazine journalist for ten years, and has studied the Chinese ‘internal’ martial and healing arts for 15 years. 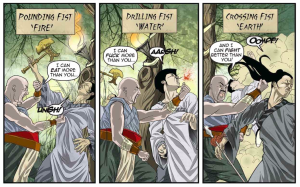 He has combined his love of Kung Fu and comics for his first graphic novel project. He is currently working on Volume 2 of White Crane, as well as several other projects, both fiction and non-fiction. Santiago Espina is comic book artist based in Argentina who has worked with Moonstone Comics and is in talks with Marvel and DC. Britain has a long tradition of unique and distinguished comic works, although comics inspired by Chinese culture have tended to come from places such as the US. So this is indeed a rare find, and I am really looking forward to volume two. 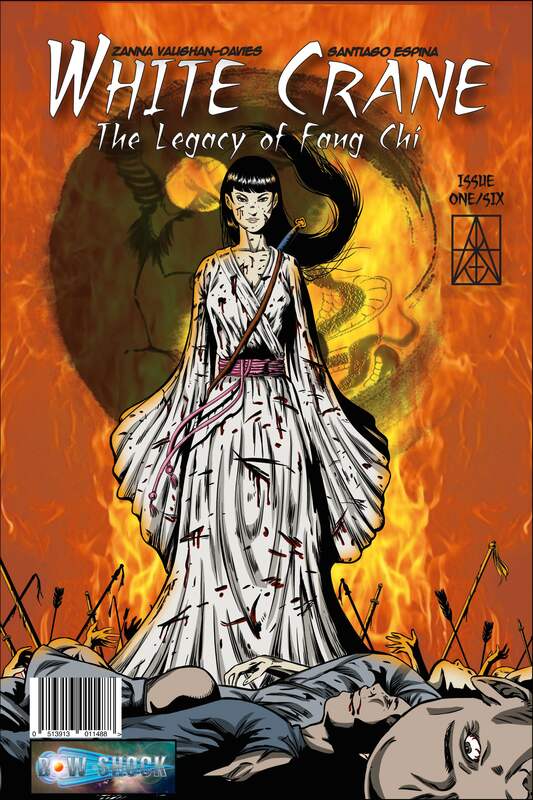 “White Crane: the Legacy of Fang Chi” is available in digital format, in printed paperwork and signed edition.